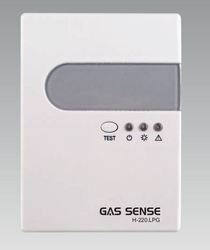 Domestic Gas Detectors.Combustible Gas Detectors.Transmitters and Sensors for Gas.Hand Portables for Gas.Detected Gas, Methane, Propane, Butane, hexane, Heptane, Methanol, ISO Popanol, Acetone, Ketone, Tolune, Hydrogen, Ammonia, LPG, CO, Monoxide, hydrogen Sulphide, Chlorine, and others. 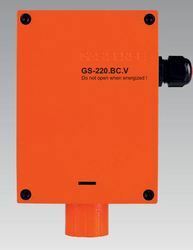 Digital Addressable gas detectors GS-ADR.BC.V for detection of combustible, toxic and refrigerant gases. The SenSmart 4000 2-Wire 4-20mA Loop Powered Gas Detector accepts electrochemical gas sensors for oxygen and toxic gas detection. SenSmart 4000s utilize our popular “GEN 2 smart sensor” proprietary technology to provide sensor recognition and temperature compensation within the SenSmart 4000. Each GEN 2 smart sensor has non-volatile memory to store, unique records of serial number, born-on date, initial calibration values, engineering units and temperature compensation algorithm. Non-Intrusive, magnetic interface calibration sequence prompts the user through zero and span calibration. Span value is user programmable. Available in non-metallic, cast aluminum or 316 stainless steel enclosures. FEATURES HIGHLIGHTField swappable sensor module. Range and target gas configured on sensor moduleImproves system noise immunity because low level sensor signals are protected within the sensor headIndustry standard 4-20mA signal may be transmitted thousands of feet on 2-wires316 SS model is suitable for Class 1 Div 1 hazardous areas.Missing or failed sensor forces <2mA FAULT signal Compatible with 1, 2, 4, 16 and 64 channel Receiver/Controllers (user calibration & readout are at the Receiver)2-wire milliamp signal is nonpolar with protective “steering diodes”SenSmart 1000 SeriesThe RC Systems SenSmart1100/1200/1300 are complete 2 or 3 wire Gas Detectors available in UL94 flame retardant plastic, or, Class 1 Div 1 316 stainless steel sensor head enclosures These easy-to-install and maintain gas detectors must be connected to an R. C. Systems single or multi-channel receiver to add user calibration and readout functions. (www.rcsystemsco.com/zoneprotector).SenSmart1100 utilizes our electrochemical temperature controlled SMART sensors to transmit O2, H2S, SO2, Cl2, HF, HCL, NO2 (to name a few) 2-wire 4-20mA gas values to R. C. Systems single and multi-channel receivers.The SenSmart1200 utilizes our “bridge” sensors, including catalytic, PID and infrared, to detect methane, propane, VOC’s, benzene, CO2 and many other compounds. The 1200’s bridge output is compatible with R. C. Systems single and multi-channel receivers.The SenSmart1300 has the same hardware as the 1100, but utilizes our ultra-low power infrared SMART sensors to detect carbon dioxide (CO2), methane, propane and other hydrocarbons. The 2-wire output (8-20mA) transmits gas values to R. C. Systems receivers. 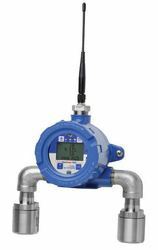 The State-of-the-art SenSmart6000gas detector is built with our proven ‘ST-44’ transmitter. This versatile unit has a bright, vivid color display and embedded Ethernet with Webserver and Modbus TCP. 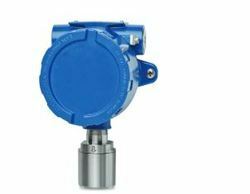 The high performance, universal gas detector supports dual smart sensors with different type like Electrochemical, Catalytic Bead, Infrared and Photoionization sensors. Senko, draeger, honeywell, RAE, and BW Sensors. Longer Life with "Hibernate" mode. 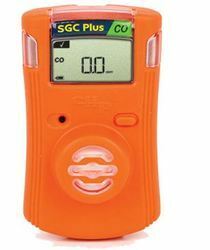 The Single Gas Clip Plus (SGC Plus), is a maintenance free handheld gas detector with built in “Hibernate” mode for detecting hydrogen sulfide H2S or carbon monoxide CO. “Hibernate” mode allows users to place this disposable single gas detector in a rested state when not in use. The SGC Plus is perfect for seasonal/turnaround contractors or rental fleets. When your job or turnaround is finished, simply synchronize the instrument with our GCT IR Link or SGC Dock to put the detector in a rested state. When you are ready to use the detector again, simply press the power button to reactivate. Use it when you need it. By hibernating the detector when not needed, you can spread 2 years of use over a 3 year period. This mode can only be enabled via IR communication with either the IR Link or SGC Dock. Only authorized personnel can place the detectors in “hibernate” mode. 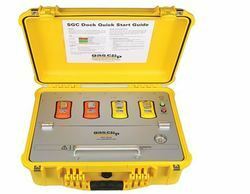 The SGC Plus also provides the most advanced maintenance free disposable single gas detector on the market. 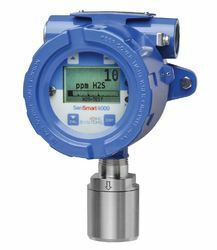 The SGC Plus combines a rugged design with and reliability and advanced sensor resolution (0.1 ppm for H2S models). 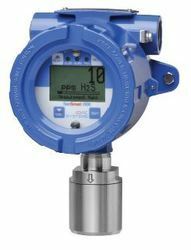 This detector allows for quick configuration adjustments to comply with current and future industrial health and safety gas exposure regulations. Be sure to compare these features to our Multi Gas Clip and Single Gas Clip to find the right product for your current application. Our main competitors Senko, Honeywell, Draeger, RAE, BW and similar products. Why test just one when you can test 4! Traditional docking stations are only designed to test one instrument at a time, resulting in time consuming testing periods as well as unnecessary usage of testing gas. Gas Clip Technologies has significantly improved both testing time and test gas usage with the SGC Dock; users can now test 4 instruments simultaneously saving both time and money. Detector Configuration/Firmware Updates: In order to keep your fleet of gas detectors compliant with specific settings, we allow for the SGC Dock to program each detector during either bump testing or calibration. The programmable fields are as follows: User ID, Calibration Interval, Bump Interval, Self-Test Interval, Low Alarm, High Alarm, Show Sensor Readings, Hide Bump Due LED and Hide Clock. For example, if your company or facility requires each detector on site to have specific alarm set points and a bump test interval, instead of programming each detector individually, the instruments can be group programmed while simultaneously bump testing (4 detectors at a time per dock) using our GCT Manager software. As firmware updates become available, we can program each SGC Dock to update detectors during bump testing and calibration. Facility safety standard compliance for single gas detectors is now easily achievable. Event Data and Record Storage: In addition to performing tests, detector configurations and firmware updates, the SGC Dock also stores important information about both the docking station and detectors tested. All tests performed on the docking station can be accessed from either the USB directly or using the GCT Manager software. Each bump test and calibration event is recorded and logged by date, time and serial number. Along with the test records, the individual event logs from each detector are saved. At the time of the test, the detector transmits its’ event log to the memory. By default, the station will save the previous 10 event logs. Day in, day out, your workers have to charge their portable multi gas detectors so they can keep testing for the presence of hydrogen sulfide (H2S), carbon monoxide (CO), oxygen (O2) and combustible gases (LEL). Unfortunately, sometimes they may forget to do so. Gas Clip Technologies can help prevent this safety risk with our new Multi Gas Clip (MGC). 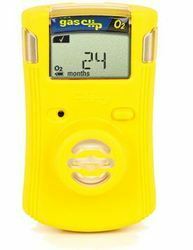 It has the longest battery life of any portable gas detector by a long shot. The new MGC can go a full 2 months without a charge, even without ever having to be turned off. Shut down the detector nightly and the battery can last up to 4 months. What’s the secret of the MGC’s extended battery life? It uses low-power photo-metric technology for the detection of the combustible gases (LEL). Instead of draining the battery with archaic pellistor technology, the MGC uses an IR source. This conserves power, so the battery lasts and lasts and lasts. 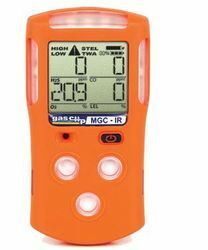 The MGC also eliminates the need to frequently calibrate portable gas detectors. It can go 12 months without being calibrated. That saves time and increases efficiency. Honeywell, Draeger, Honeywell Analytics, RAE, BW Type of Gas Portables. Twice a day, every day… that’s how often you have to charge most portable gas detectors, until now. Introducing the Multi Gas Clip Pump (MGC Pump) from Gas Clip Technologies, the only portable multi gas detector with an internal sampling pump that can go an entire work week without a charge. The MGC Pump follows in the long line of portable gas detectors by Gas Clip Technologies that last and last and last. Being able to go a long time between charges is a family tradition. Like our MGC, the MGC Pump uses low-power photometric infrared technology to detect combustible gases (LEL) rather than age-old pellistor technology. The MGC Pump uses an IR source which conserves power and helps the battery last and last. The MGC Pump is also designed for comfort. The reduced, sloping shape of the holding area at the bottom of the instrument makes the MGC Pump a comfortable fit in the hands of your workers. It is fully submersible and simple to operate. 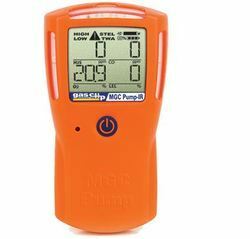 The MGC Pump offers a one button design and the largest LCD screen in the industry so it’s easy to read. Other multi gas detectors require calibration anywhere from 1 to 3 months. The MGC Pump can go 12 months without being calibrated. This is an added benefit of IR sensing technology because IR is immune to pellistor sensor poisons such as silicone or H2S. Looking for Hazardous Atex Ex IECEX Gas Detectors ?